McCall is a two hour drive from Boise, along the beautiful and scenic Payette River Scenic Byway. 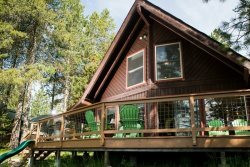 Head north on Idaho Highway 55 for 100 miles, and you will be in the heart of our beautiful town enjoying the view of Payette Lake. Arriving from the north? Find your way onto US-95 South, and turn onto Idaho Highway 55 in New Meadows, ID.